Where applicable. Posi Quiet fiction formulas create less dust, thus keeping wheels cleaner. 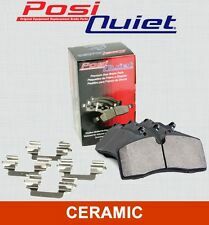 1 Front Set of Posi Quiet Ceramic Brake Pads (both axles). Warranty claim will not be granted if parts have been altered or show any signs of misuse. Where applicable. Posi Quiet fiction formulas create less dust, thus keeping wheels cleaner. 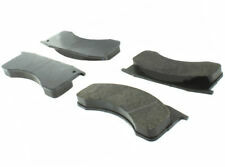 1 Rear Set of Posi Quiet Ceramic Brake Pads (both axles). Warranty claim will not be granted if parts have been altered or show any signs of misuse. Warranty Type:Manufacturer Warranty. Warranty Duration:1 Year. Our administrative offices are located in Union, New Jersey and distribution facilities are located throughout the US. The item specifics section also contains important details. 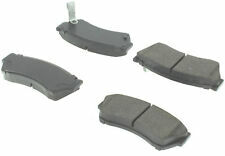 12 pc caliper kit covers for both calipers. SUZUKI SX4 2007-2013. SUZUKI KIZASHI 2010-2013. HONDA PRELUDE 1988-2001. HONDA CR-Z 2011-2015. HONDA CIVIC 2002-2015. ACURA TSX 2004-2008. ACURA RSX 2002-2006. 2001-2018 Dodge RAM 1500. 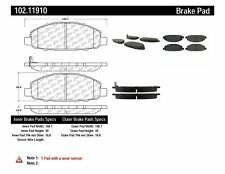 22 pc caliper rebuild kit includes. 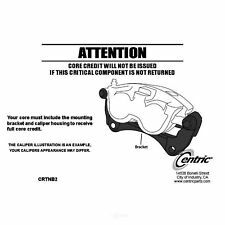 New pair of Centric rear parking brake shoes. Shoes go inside rear rotor. Sold as a pair. Fits the following 97-04 Corvette. 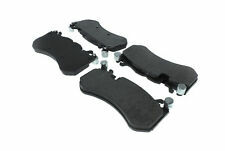 05-12 Corvette Base models (Does not fit Z06/ZR1). 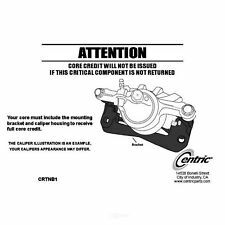 Key Search Words - 2000 : Centric Parts, CentricParts, Centric, Centric Caliper, Centric Parts Caliper, Centric Caliper Repair, Centric Caliper Kits. Position: Rear. To confirm that this part fits your vehicle, enter your vehicle's Year, Make, Model, Trim and Engine in theCompatibility Table. Position: Front. With over 30 years experience, we are your complete parts source! Part Numbers: 104.06990, 106.06990, 1402-69893, 14D699C, 1AMV100699, 1AMV300699, 200-0699, ATD699C, ATD699M, AXCD699, AXMD699, EHT699H, MGD699CH, MGD699MH, P300.06990, SGD699C, SGD699M, SP699PPH. This part generally fits Chevrolet, GMC vehicles and includes models such as C3500HD, P30, P35, P3500, P40, P4500 with the trims of Base, Base Cab & Chassis - Long Conventional 2-Door, Base Cab & Chassis 2-Door, Base Standard Cargo Van 2-Door, Base Stripped Chassis, P4T042 Straight Truck - Cab Forward, P4T042 Stripped Chassis - Cab Forward, Step-Van Standard Cargo Van 2-Door, Value Van Standard Cargo Van 2-Door. 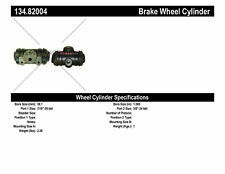 Key Search Words - 2000 : Centric Parts, Centric, CentricParts, Centric Parts Wheel Bearing, C-tek, Ctek, C-Tek Wheel Bearing. Higer Load Capacity. Widest range of wheel hubs and bearings in the market. 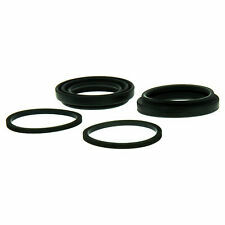 We strive to get you the right, quality part at a fair price as quickly as possible. Warranty Duration:1 Year. 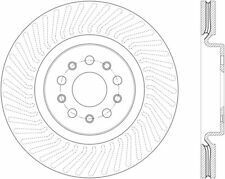 SportStop drilled and slotted brake rotors prevent glazing of the pads, add bite and improve wet and dry braking performance. Every SportStop rotor is finished with a black e-coating on both sides of the hat, inside the cooling vanes and on the outside edge. SportStop cross-drilled rotors look great behind custom wheels, improve the initial bite of the brake pads, and help wipe away the debris that forms between the pad and the disc. Every SportStop rotor is finished with a black e-coating on both sides of the hat, inside the cooling vanes and on the outside edge. Warranty Type:Manufacturer Warranty. Warranty Duration:1 Year. We are a staffed by Knowledgeable and experienced professionals, giving you "just good old fashioned friendly service"! 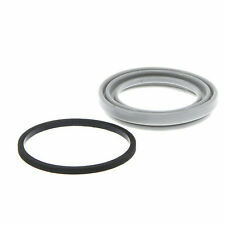 Part Number: 412.65000E. Product Details Warranty: unspecified lengthOverview. To confirm that this part fits your vehicle, enter your vehicle's Year, Make, Model, Trim and Engine in theCompatibility Table. You need to hover your mouse over the left column to read the complete text. Position: Front. You need to hover your mouse over the left column to read the complete text. Part Numbers: 1410-45345. To confirm that this part fits your vehicle, enter your vehicle's Year, Make, Model, Trim and Engine in theCompatibility Table. You need to hover your mouse over the left column to read the complete text. Part Numbers: 1410-02745. To confirm that this part fits your vehicle, enter your vehicle's Year, Make, Model, Trim and Engine in theCompatibility Table. The engine types may include 2.0L 1955CC l4 GAS Naturally Aspirated, 2.0L 1955CC l4 GAS SOHC Naturally Aspirated. This part fits vehicles made in the following years 1986, 1987, 1988, 1989. To confirm that this part fits your vehicle, enter your vehicle's Year, Make, Model, Trim and Engine in theCompatibility Table. Position: Front. You need to hover your mouse over the left column to read the complete text. Part Numbers: 1410-49592. To confirm that this part fits your vehicle, enter your vehicle's Year, Make, Model, Trim and Engine in theCompatibility Table. StopTech's industry leading technologies and materials- from rock solid calipers to ingeniously efficient heat handling rotors- result in shorter stopping distances- better brake modulation- and less brake fade. To confirm that this part fits your vehicle, enter your vehicle's Year, Make, Model, Trim and Engine in theCompatibility Table. The engine types may include 2.0L 1999CC 122Cu. V6 GAS DOHC Naturally Aspirated, 3.5L 3496CC 213Cu. Trending at C $26.83eBay determines this price through a machine-learned model of the product's sale prices within the last 90 days. Portions of the part information on this page have been provided by WHI Solutions, Inc. Warranty Type: Manufacturer Warranty. WARRANTYWarranty Duration: Other. Drain any fluids and wrap in a tied plastic bag. TOYOTA RAV4 2006-2015. TOYOTA AVALON 2008-2015. TOYOTA CAMRY 2007-2016. LEXUS ES300H 2013-2014. LEXUS ES350 2007-2015. LEXUS HS250H 2010. TOYOTA MATRIX 2009-2013. 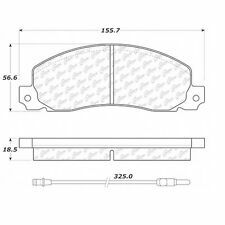 All Centric brake pads comply to current brake friction material legislation.